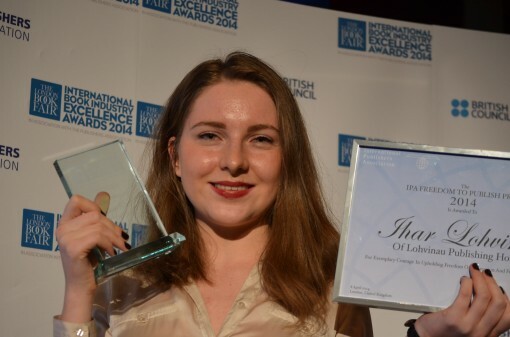 A new fixture of the London Book Fair are international awards for excellence in categories ranging from translation initiatives to digital entrepreneurship. 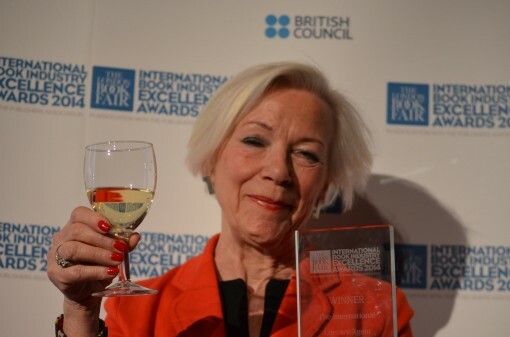 Anneli Hoeir raises a glass to being named International Literary Agent of the Year. Sixteen awards were presented recognizing industry achievement across the globe, acknowledging the book world’s “collective success in crossing borders, cultures and languages,” in Thomas’ words. Danish agent Anneli Hoier from the Leonhardt & Hoier agency was named International Literary Agent and in one of the evening’s most moving moments Alexandra Logvinova from the House of Literature in Belarus accepted the Freedom to Publish Award on behalf of her father, Ihar Lohvinau, whose publishing work in Belarus has been banned by the Ministry of Information. Alexandra Logvinova celebrates her father’s Freedom to Publish Award. London Book Fair diretor Jacks Thomas has put a new spotlight on the international market here in London. Another popular win was Brazil’s Ricardo Almeida, president of Clube de Autores — a self-publishing platform — who was named British Council Digital Publishing Entrepreneur of the Year. These awards can surely only grow in stature now. There will be tweaks along the way, of course – sponsors come and go (if you’re wondering about Montegrappa’s connection, their luxury pens goods were favored by Hemingway in the past and Paulo Coelho today) – and some awards may be dropped and others included. But the idea of recognising international achievements in the book trade has now been firmly established – there’s a marker in the publishing sand that was long overdue, and it will be fascinating to see what develops. 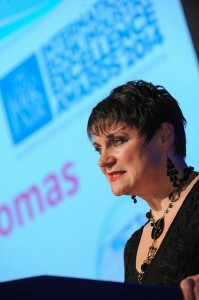 The London Book Fair Lifetime Achievement Award was presented to Deborah Rogers of Rogers, Coleridge and White. Who would have you nominated? Let us know in the comments.